July 19th in Home Automation, Mac Software, Gadgets by Jon Smith . 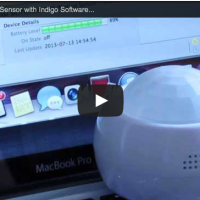 Super in-depth video, showing how to set up the Z-Wave Multisensor from Aeon Labs, PLUS see it working with Indigo Software on an Apple Mac. One of the coolest things about home automation (we think) are the clever sensors that trigger various actions, such as turning on lights or sending email alerts. The Aeon Labs Multisensor is one such device, and we really like it. It’s a 4-in-1 sensor, able to detect movement, light, temperature and humidity in your room (or outdoors!). Not bad for a device which costs about £40 – 50 in the UK. Watch our in-depth video, showing everything from setting up the device, to including it in the Z-Wave network, and operation with Mac automation software Indigo. Note: We’ve also done a Z-Wave Aeon Labs MultiSensor Unboxing video if you missed it, take a look. We’ve been running the Aeon Labs MultiSensor in our Z-Wave network for a few weeks, and so far, we’ve had no problems with it. As such, we’ve got no problems recommending this device for anyone who wants a motion sensor, PLUS you get temperature, light and humidity sensors thrown in! Caution: If you’re looking at other motion sensors in your Z-Wave network, remember to look to see if they at least include a light sensor too. Without this, then you can’t do cool stuff like automate your set-up to turn on the lights upon detection of motion but only WHEN ITS DARK. More Z-wave home automation videos coming soon. Remember to subscribe to our email updates, or follow us on Twitter (see top right of webpage). Self-confessed tech and gadget geek. Love all kinds of tech, but especially that which helps me work more effectively, and looks / feels good to use. Reply Fitting The Aeon Labs MultiSensor To Your Wall / Ceiling ← Todays Top Tech . July 20, 2013 . Reply Jim . January 5, 2015 . Hi, Do you know how to change the Temp display from Celsius to Fahrenheit on this Fibaro sensor? I also use Indigo Pro 6 on my Mac.